I left Nagoya and took a Shinkansen to Osaka, where I had a lot of expectations of having fun and see amazing urban views. 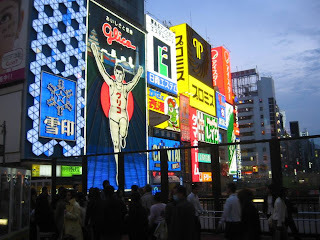 Some movies, like Blade Runner or the great Japanese Anime called Ghost In The Shell, were based after Osaka to represent an apocalyptic city from the future. 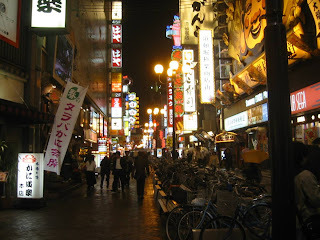 I took katsudon in a yoshinoya and then I went to see the wonderful area of Dotonbori. It was amazing, just like in the movies. 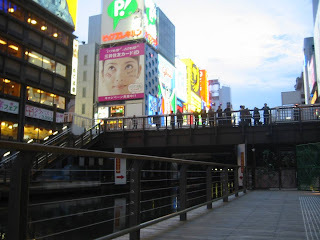 Full of people, the famous bridges, the lights, the sounds, everything was like in my thoughts. I decided to have a burguer in the second floor of a building placed right in front of the most famous bridge. 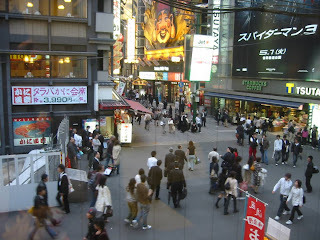 From there I spied the Japanese and took some pictures he he. I was lucky that it started to rain because the area looked more apocalyptic. 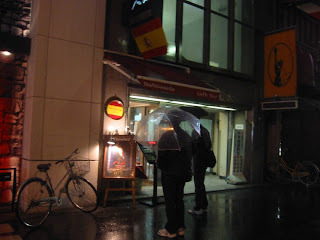 I was wandering around for a while seing street after street (I found a spanish flamenco local!) and then I decided to enter a disco. 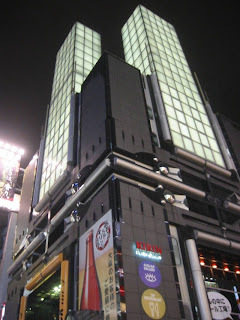 In the hotel, I had been looking in the Internet for discos in Osaka and I wrote down several addresses. However I could only find one of them! It was very hard to figure out in Japan whether a local was a disco or what. If you heard music and lots of sound... it was a pachinko not a disco!. Then there were lots of locals and clubs that looked like.. whore houses?... So, I finally entered to the Club Pure, a very famous club where a lot of gaijins (foreigners) go out. It was a normal disco, a bit small for what I was looking for (that is, a BIG ONE with lots of lights and people) but with an interesting point: you only pay the entrance (18Euros) and you get all you can drink all the night. I entered the disco too early and there were no people! I had to wait some minutes so people started to come. I met a very funny guy from London who was about to get drunk. 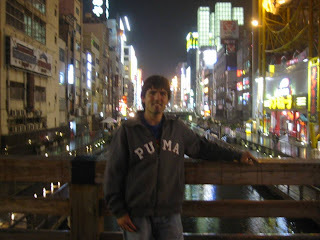 He was working as an english teacher in Osaka for one year. I also met some guys from Belgium that were working for Toyota in Nagoya. The music of the disco was awful but at least it was a cheap way of going to a disco in the center of Osaka. 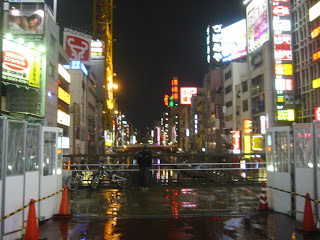 When I went out of the disco, at around 5am, suddenly a woman of around 26 year old pull my arm and offered me a massage for 3000 yen (around 20 Eur).